Claimed in several circles as one of the “Ugliest Buildings in Overland Park”; the 6601 College Boulevard building was transformed into over 101,241 square feet of Class-A office space. Jonkman Construction removed all of the existing exterior brick and replaced it with 1,593 large glass units totaling 39,150 square feet of high efficiency Low-E glass. The Lightweight Taktl concrete wall panels and custom colored ACM sheet metal paneling systems diffuse throughout the glass façade. The Jonkman team continued the work by dismantling and removing the building’s operating systems and replaced them with energy efficient hot/cold water cooling & heating system. Furthermore, Jonkman Construction added all new electrical systems, Building Management Controls, and refined elevator systems. 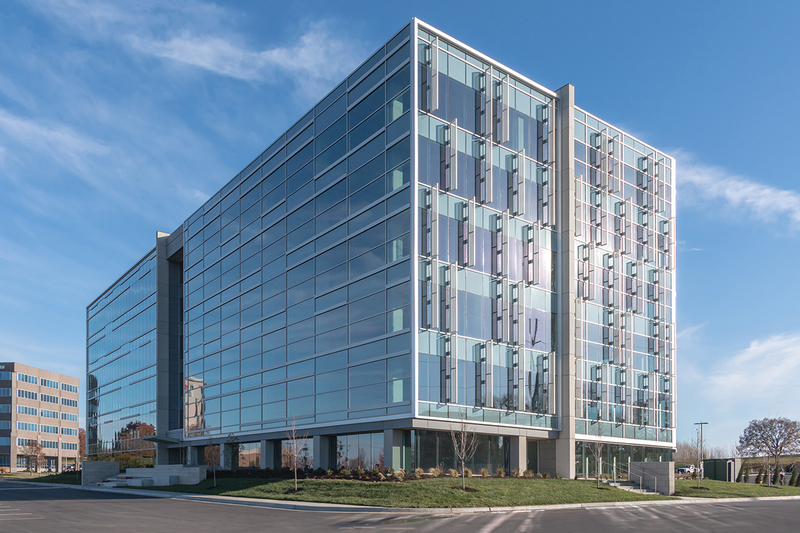 The 6601 College Boulevard building was honored with a Capstone Award by the Kansas City Business Journal and a Commercial Development Award form the Overland Park Economic Development Council, along with numerous other local and regional awards.